Hello Rademacher fans – I’ve been out of town the last 10 days on a trip to Nebraska and Iowa. Resuming our story…the last time we looked at the Rademacher family, we learned about the big 50th Anniversary Celebration in 1920 for Joseph and Josepha Rademacher, the immigrant ancestors who settled in Crete, Nebraska. My dad [Clem] helped in the field when they were using horses. He drove the hay stacker for them first. When he was little older, he got to drive the hay rake and then the mower. He would drive four horses on the cultivator. He would guide the two middle horses and grandpa would tie the side lines to the cultivator where my dad would put his foot on them. Uncle Ted drove two mules. He was cultivating sugar beets. Both boys would haul the beets to the sugar factory. When my dad got a little older, he helped all the time in the fields. When dad’s younger brothers were older, they had to help with the work. Their names are Uncle Joe, Uncle Albert, Uncle John, Uncle Leo, and Uncle Bernard. My dad’s sisters are Aunt Bertha, and Aunt Elizabeth. All had to take their turns with the chores of feeding chickens, cows, and horses. They always had cows to milk too. They drove the stacker team for the hay harvest. 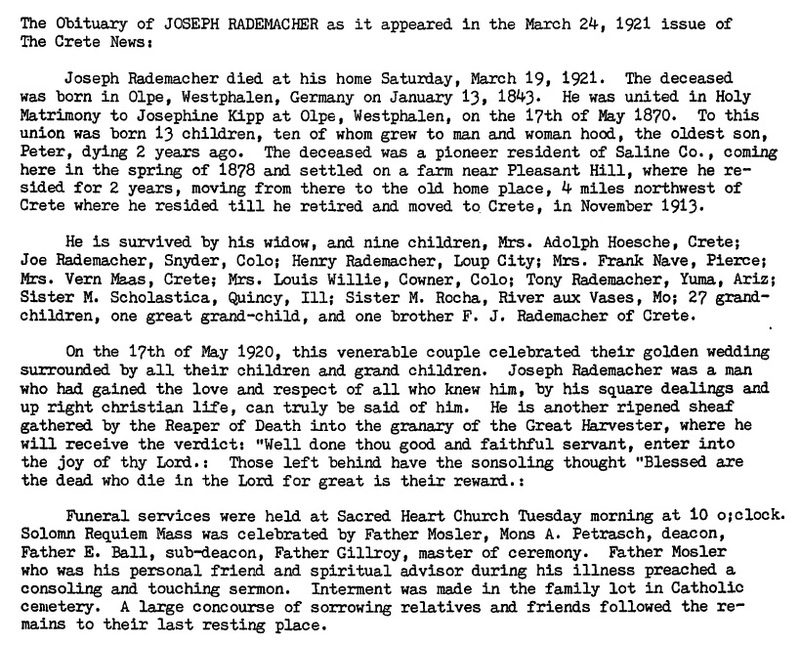 Joe’s father Joseph Rademacher, whose anniversary they celebrated in 1920, died in March 1921. Here’s the text of his obituary. It’s kind of corny, but I like the part about him being “another ripened sheaf gathered by the Reaper of Death into the granary of the Great Harvester..”. They don’t write ’em like that anymore! Clem told us about the general store, it was a very big building, you could buy anything from fancy lace to a tractor. It had a big shiny chrome decorated black iron wood burning stove in the center. It had a dent in it, put there by his Dad, Joe, who came in one day, really angry about a cattle deal gone bad, hauled off and hit it with his fist. Joe was a very strong man. The store was a good place to just spend time and chat with neighbors, hear all the news. Like all boys, Clem loved sweet; so when a traveling salesman was giving out samples of canned peaches Clem was delighted to try one. He had never seen food in a can before. The peaches were so good he ate the whole can by himself. Clem said they were the best peaches he ever ate. This remembrance hints at Joe’s frustration with cattle prices and the trouble brewing for the Rademacher family. The years after World War I are remembered as the “golden age of agriculture”. Prices for crops and livestock doubled during this period and farming profits reached record highs. By 1922, however, farm profits plummeted to values that were lower than the pre-war years. Family legend is that Joe Rademacher had invested heavily in cattle during the boom years only to have his investments fail when the bottom dropped out of the market. The family’s fortunes were dealt an even more severe blow in the spring of 1924. A new daughter Elizabeth had just been added to the family on March 3. Not three weeks later, though, older daughter Mary took ill. She died on March 24. A neighbor girl who Dale and I met decades later (more about her in a future post) remembered her playmate Mary very well, and also remembered how after Mary died, the house was kept dark except for a single candle flickering in the front window. This was the second daughter that Joe and Annie lost; how tightly they must have held onto the two girls who remained (five-year-old Bertha and newborn Elizabeth). 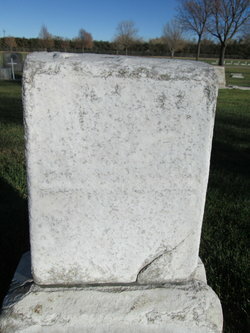 Mary was buried beside her sister (the first Elizabeth) in the cemetery in Brush. They share the same tombstone. I do not know her cause of death (will see if I can find out someday). I have never seen a picture of Mary, though doubtless she is one of the children present in the family group photo taken in Crete in 1920.